I'm Not Sure I Even Have A Story! 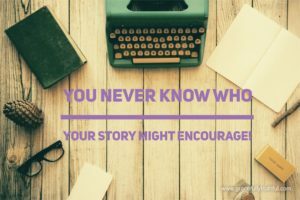 You Do Have A Story! Just because you haven’t given much thought to it, doesn’t mean you don’t have one or that it’s boring… It Isn’t! 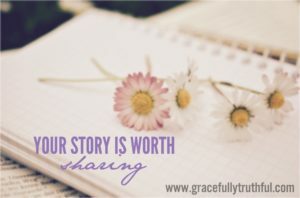 By going through the work of writing your story, you will grow personally, you’ll see God’s hand more clearly in your life, and by sharing it, you’ll be inviting others to see God’s glory in an incredible and unique way! It. Is. Worth. It. A great way to start your story is with a simple timeline tool. Pick a date you feel is your “beginning” and think back slowly to mile marker events that really shaped you and impacted your life from that date until the present. Once it’s plotted out for you to see, plan a few time blocks to sit and pour out your heart. No one else is watching, no one is judging, this is between you and God and the paper in front of you. It’s imperative that you don’t edit anything at this stage! Just write out your life events from your perspective. This is your story, even more so, it’s the stage that God chose to display His glory! When you’re all done, read and re-read it and decide which parts you want to share, and which parts were just good for you to write out personally. Send your first draft to our Faces Editor and she will work with you to produce a polished finish that you are happy with. Watch what God will do! 3) any links you’d like to add (facebook, twitter, instagram, your blog, etc). We will post your story with a link to your own static page that shares your journey.